"Keeping you safe and the intruders out." Expert installation of burglar alarms in Hertfordshire & London. We install a range of CCTV systems for personal and business needs. All of our systems can be tailored to specific requirements, budgets and property surroundings. We specialise in linking your CCTV systems to your iPhone or iPad for viewing on the move! We install intruder alarms for a range of clients from residential, small shops to offices and large commercial properties. We're happy to advise on which alarm would be best for you and your requirements. We provide a wide range of access and entry phone systems to suit any requirement. From simple to complex entry systems, we can tailor our access control around any commercial or industrial premises. Security system installation across London. 3rd Century Ltd is an independent security company that installs, repairs and maintains a wide range of security systems. All our work is carried out with an extremely high standard and our finish is always as discreet as possible. Operating throughout the south of England, we offer our services to the residential, commercial, retail, industrial & public sectors. Helping you relax in your home or business. Expert installation of burglar alarms in Hertfordshire. At 3rd Century Ltd we install intruder alarms for a range of clients from residential, small shops to offices and large commercial properties. We're happy to advise on which alarm would be best for you and your requirements. So no matter the size of the project you know you'll always get the highest quality finish. 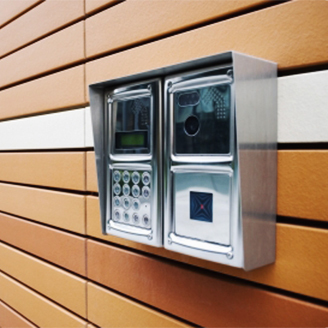 We can visit your property to discuss what options are available, so you can choose the best intruder alarm for your property. Perfectly installed access systems from 3rd Century Ltd.
At 3rd Century Ltd we provide a wide range of access and entry phone systems to suit any requirement. From simple to complex entry systems, we can tailor our access control around any commercial or industrial premises. Multi user & PC based systems and more!